The division of space in the directions of the winds has been a very old way of orienteering. The sailors might have been the first who perfected the way of finding their next port by a dominant wind direction. The sea is in that respect more basic than the journeys over land. The sea is a dynamic surface, with forceful winds and only the sun (by day) and the stars (by night) to guide the way. The Chinese wrote about ‘wind-seasons’ as early as the first century BC and distinguished twenty-four seasonal winds. The Ancient Greek also gave names to the winds and these denominations became a synonym for a direction (BOORSTIN, 1983; Ch. 29). 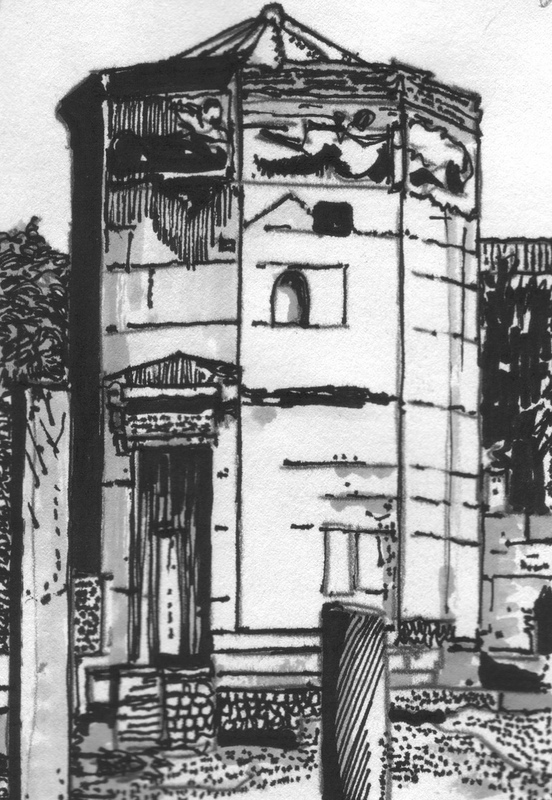 The well-known ‘Tower of the Winds’ in Athens was built in the second century BC (fig. 268). Fig. 268 – The Tower of Winds in Athens was built in the second century BC and can be seen as a tetradic monument with a symbolic and practical importance. The octagonal shape was related to the cardinal points, representing an abstract division of space. The octagonal shape of the tower pointed to a distinct form of division thinking (2 x 4): the four principal wind directions and four other points in between. The tower, which still stands today, is one of the oldest blueprints for the relation between direction and division captured in stone. The construction of the tower took place in the second half of the Fourth Quadrant of the Greek cultural period (fig. 74). This particular part of the communication is known (from the Egyptian cultural period) to be most conscious of the fourfold-division and was typified in the latter case as a ‘Late Renaissance’. A twelve-fold wind rose was given in a manuscript of Isidore of Seville ‘De Natura Rerum’ (‘Traite de la Nature’; Ms 422, fol. 5v, also called the ‘Book of Wheels’, because of its circular illustrations) preserved in the Bibliothèque municipale of Laon. This manuscript was copied in the middle of the eighth century at the atelier Ste Marie-St Jean. Here the four main cardinal directions are symbolized as persons, each being assisted by a pair of smaller persons, making up a total of twelve. The wind rose got serious competition from the magnetic compass from the twelfth century onwards. The application of the magnetized needle to navigation occurred in China from about 1000 AD, but it had a much longer history as a means of prediction and fortune telling. This practice, which is still important in the Chinese mind, was prominent as a holy and spiritual exercise in the Chinese Han Dynasty (200 BC – 200 AD). 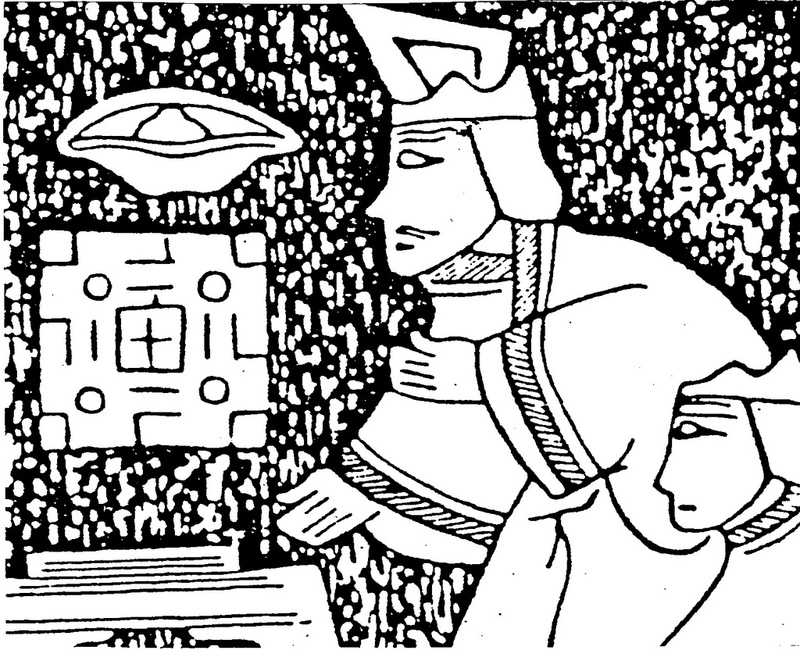 Priests employed the so-called TLV-mirror to read the future (fig. 269). Fig. 269 – This detail from the ‘Tomb of the Painted Basket’ (Harada – Lo Lung, China) shows some priests in the process of fortune telling by a magnetic needle and a TLV mirror. The square TLV mirror, named after the pattern formed by these letters, is a model of the earth and the needle provided an ‘independent’ direction in the universe (KAPLAN, 1937). It took another eighth hundred year for the magnetic needle to be used as a navigational device and another two hundred before Alexander Neckam (1157 – 1217) gave the first mentioning of the magnet in a European writing. The subdivision of the various directions could be more precise when using the magnetic needle and sixteen or thirty-two directional points were possible. The idea of a division in a factor of four remained unchanged (4-8-16-32-etc.). The rose window is a relevant sign of a new perception in division thinking applied in architecture. 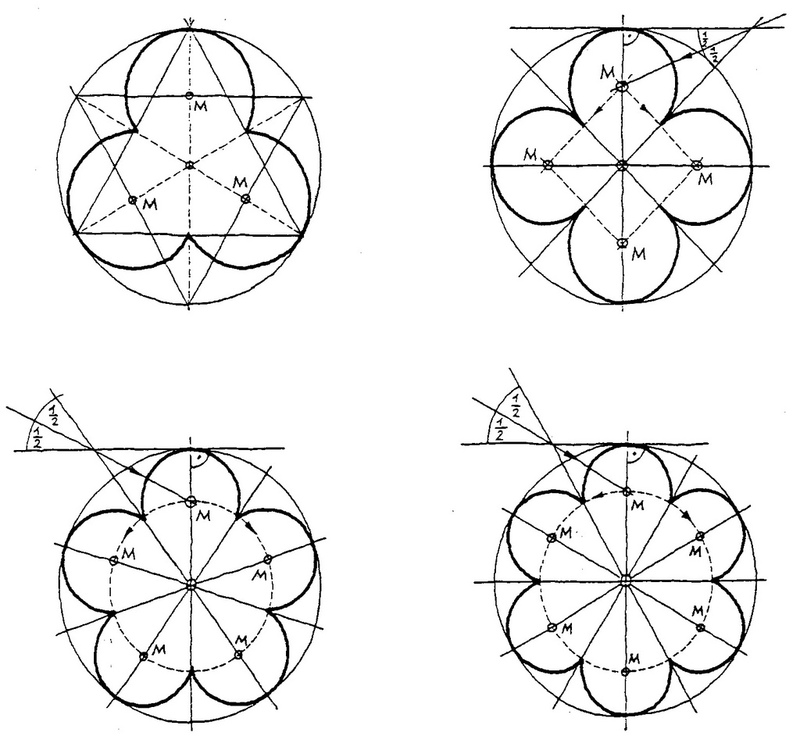 The construction of a rose window is based on the principle of circles within a circle (fig. 270). The actual number of circles can vary, depending on the choice of subdivision. It is worth noting that the geometrical construction of the ‘Notre-Dame’-type of rose window starts with a hexagon, which is subsequently divided in twelve parts. Three- and four-division find each other here in harmony. The rose window in the abbey church of Saint-Denis (Paris) has even doubled the twelve parts into twenty-four parts. Fig. 270 – The various types of basic rose windows are given here as a geometrical division of a large circle with three, four, five or six inner circles. The construction of the midpoints (M) is indicated, according to NETZ (1982). The rose windows were a relative late development in the history of French cathedral building-as-a-whole. The feature reached its artistic beauty only after the old craft of working with stained glass was fully employed and perfected. The addition of colors added a new momentum to the play of light as it was pioneered in the French church architecture in general. About hundred and seventy original windows are still intact. The break-through took place in a relative short time span of some fifty years. 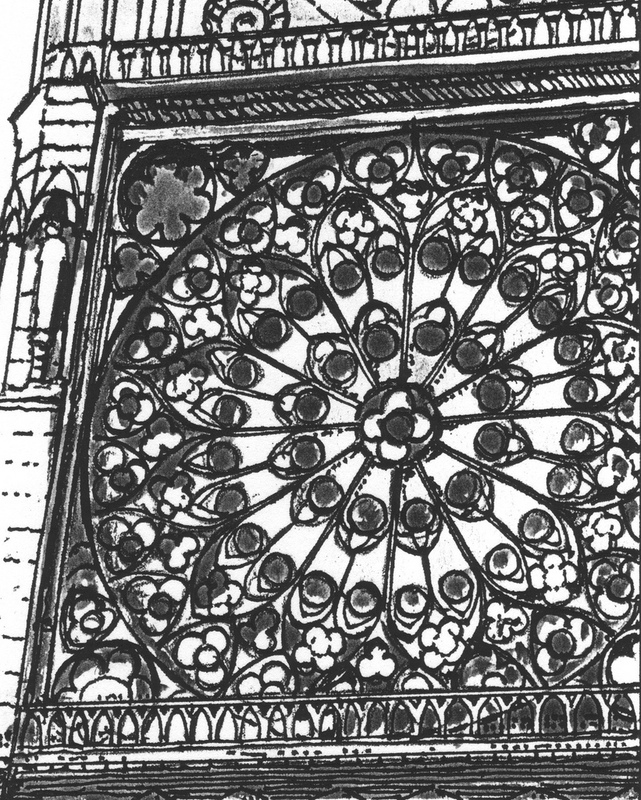 The first rose window to qualify was probably the wheel at Saint-Denis (Paris) (fig. 271). Abbot Sugar, who commissioned the church in 1144, advised the use of stained glass in order to transform everything ‘that which is material to that which is immaterial’. The signs of the Evangelists on the periphery of the window emphasized a further symbolic reading. Fig. 271 – The present view of the rose window in the west front of the church of St. Denis in Paris is a nineteenth century recreation by Violet-le-Duc. The original geometrical feature dated from the year 1144 and was probably filled with stained glass. Scamozzi showed the window in a drawing of the abbey in 1600, but an engraving from 1641 depicted only a clock. The window (with twelve spokes) was surrounded by the symbols of the four Evangelists. The west rose of the cathedral of Mantes dated from 1200, the west rose of Notre Dame of Paris was completed around 1220. Other examples are the early examples at Laon (c. 1200; fig. 272) and Chartres (1216). The west window of the latter is probably the greatest in size (some fourteen meters in diameter) and characterized by its blue glass. 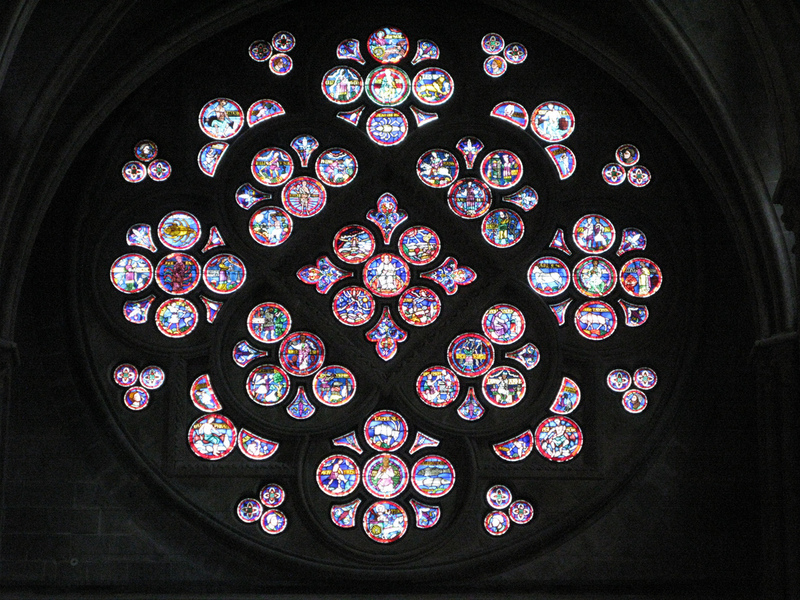 There are different types of rose windows at the cathedral of Chartres (fig. 273), each covering the twelve-division, using circles and half-circles. 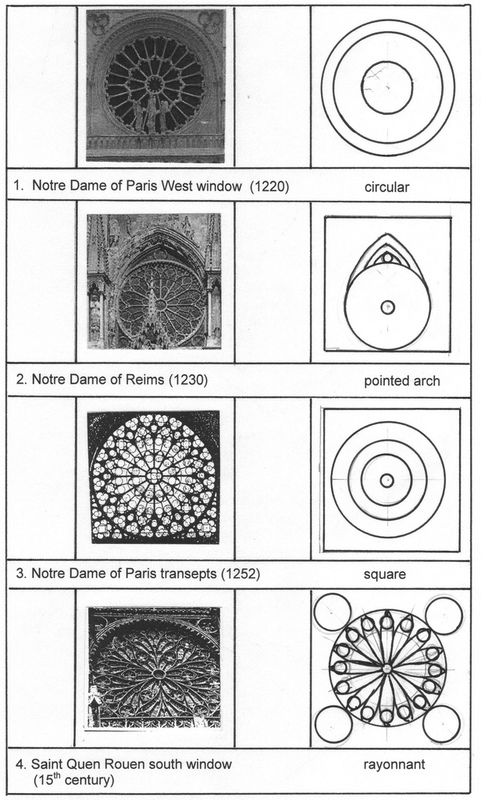 The round windows of the cathedrals of Reims (1230 – 1260) and Lausanne (Switzerland; 1225 – 1235; see p. 349, fig. 282/283) are also noteworthy. Late examples are the Flamboyant roses, appearing around 1400 in the cathedrals of Amiens (c. 1400), Rouen (c. 1440) and Tours west (c.1500). Fig. 272 – The rose windows in the northern transept (above) and northern façade (below) of the cathedral of Laon mark the variety of design in the early stages of its development. Fig. 273 – The rose windows in the northern transept (above), southern transept (middle) and western façade (below) of the Chartres Cathedral indicate different division elements. This explanation in terms of Jungian psychology does have an attractive side. The observer can apply the visibility of the rose window on a spiritual, meditative and emotional level. The pictures in the stained glass windows have their own story to tell. The metaphysical significance of numbers becomes more important for people, who wanted a ‘visible proof’ of religious power. The emphasis on material visibility – as it came about in the building of the cathedrals in Europe – opened the way to a preference for the linear way of thinking. It is a curious fact, that the introduction of the round rose window – around 1200 – marked the very moment in time, that the circular lost its function as a tool for mental guidance. The linear and hierarchical forces in the perception of reality took the overhand. The search for greater heights was on and building on an ever bigger scale became imperative. The historical observations during the great expansion of cathedral building can lead to the suggestion, that the transition from the circular to the linear (around 1200AD) and back (around 1800) are the most important moments in the (visible) visibility of the European cultural presence. Everything, which was expressed during those six hundred years by Europe-as-a-cultural-unity, formed its real being. All architectural activities before and after this period were partly guided by invisible sources, which are different from the visible expressions of its own identity (fig. 274). Fig. 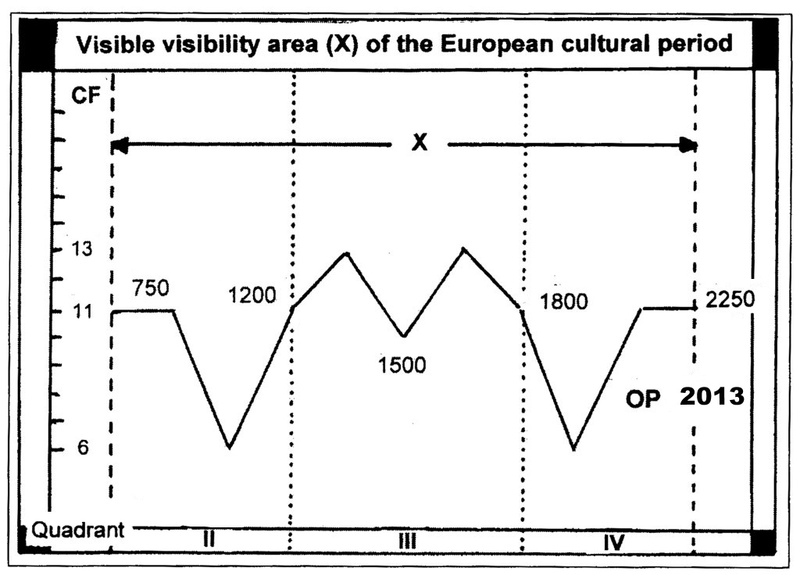 274 – The central position of the Third Quadrant (1200 – 1800) within the visibility area X (750 – 2250) of the European cultural history as defined by a (quadralectic) observer at the beginning of the twenty-first century (OP, 2013). The moments of change from a circular to a linear (1200) outlook and back (1800) are of prime importance for the establishment of the European identity. The feeling of beauty in the architecture after 1800 was either generated by a search in the storehouse of the Greek-Roman past or in the application of hitherto unused materials. Building in steel, forced concrete and glass produced an archetypal kind of architecture. Any ‘postmodern’ architectural message has now to be found in the invisible part of the (quadralectic) specter rather than in the material presence of the building itself. A further partitioning of architectonic elements is possible on a theoretical-linear level. The pentacle (5) refers to magic and Christ’s wounds, the six-division is associated with the balance of the soul, Solomon’s seal and the completion of the works of Creation in six days. The number seven (7) is long-time established as a holy and mystic number pointing to ages, planets, virtues and the liberal arts. The octagon (8) or double four stands for baptism and rebirth, while twelve (12) is the number of perfection, universe, time, the apostles, the Zodiac, the tribes of Israel and the precious stones in the foundations of the New Jerusalem. The meaning of this type of numerology was standard knowledge at the middle of the twelve-century and only increased when the first serious scholars took on the immense field of information, which was left in store by the Church fathers. Anna ESMEIJER (1984) pointed to the rota, which might have acted as educational tools in the transmission of historical (religious) knowledge. She gave the Tractatus by Hugo of Fouilloy (1140) as an example. The latter author became well-known for his bestiaries, moralizing descriptions of animals, of which the J. Paul Getty Museum in Los Angeles keeps an exceptional good manuscript (from around 1270). The symbolic force of the rota Fortunae (wheel of Fortuna) was part of an exegetic apparatus, which gained force when material prosperity increased at the end of the twelfth century (fig. 275). Fig. 275 – The Rota Fortunae and the ‘Rule of Four’ was well known by the builders of the first rose windows and acted as inspiration (MS Latin 83, fol. 66v in the John Rylands Library, Manchester). The goddess Fortuna belonged to the Roman pantheon. She made, in the fourth century AD, the transition of the Roman spiritual world into the burgeoning Christian Europe. The ‘Wheel of Fortune’ seems to be a remnant of an old four-fold way of thinking. The theme got a new lease of life in the dynamic times of the eleventh and twelfth century and fitted into the concept of a Tetragonus Mundus. Four phases in the cyclic movement were recognized in the original Roman setting and known as the ‘Rule of Four’ (PATCH, 1927): 1. Regno (I rule), when on top; 2. Regnavi (I did rule, but Fortuna took my luck away), to the left, going down, anti-clockwise; 3. Sum sine regno (I have nothing left to rule), below, down in the doldrums and 4. Regnabo (I will reign (again) and come up, to the right. The document in the John Rylands Library dated from around the eighth century. The drawing was possibly added in the thirteenth century. Wiltrud MERSMANN (1982; fig. 95) pointed to its possible origin in southern Italy. The ‘Wheel of Fortune’ was compared to ‘the earliest known example’ of this feature in a Monte Cassino manuscript (around 1100). The movement is clockwise in the latter. The four-fold rota scheme was often followed in a rather informal way. The rota fortuna at the cathedral of Beauvais, for instance, emphasized the movement with many figures rather than the classical four phases. Another departure was the search for simplicity in the two- or three-fold. The depiction of the Last Judgment, portrayed in the west roses at Chartres and Mantes, emphasized a ‘polarization of good and evil above and below and Christ at the center as mediator’. 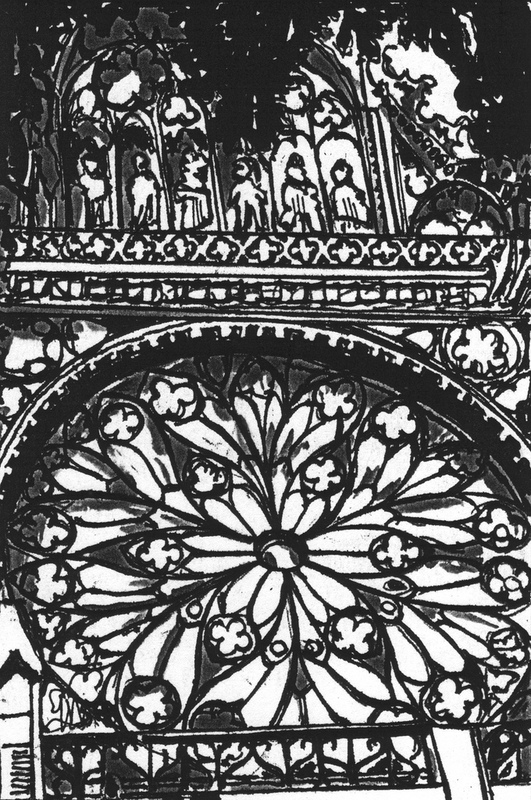 The fifteenth-century rose window of the upper chapel of the Sainte-Chapelle in Paris depicted a similar theme, following St. John’s Revelations. Jurgis BALTRUSAITIS (1938) wrote a comprehensive article on the symbolic meaning of the ‘Roses des vents’ in the Middle Ages. He pointed to the ancient astronomical knowledge, which joined with Christian ideas. This fusion seemed to be complete during Carolingian times, when the Christians used the twelve signs of the Zodiac to their own discretion. This enrichment had an impact on the architectural endeavors, which followed in the further developments of Romanesque and Gothic styles. A convincing ‘classification’ of the rose windows – in France or other European countries – is not easy to establish. Different forms occur in time simultaneously, as was noticed in the rose windows of the cathedrals of Laon and Chartres (fig. 272/273). Christopher WILSON (1990; p. 68) remarked, in his learned survey, that ‘few major facades were built during the second half of the 12th century because the naves of most of the early Gothic cathedrals remained unfinished until well after 1200’. Unfortunately, his book did not pay attention to the occurrence of rose windows as dynamic elements, which were caught up in the rapid developments towards the end of the twelfth century. The Catholic Encyclopedia (KRIEHN, 1913/1996) distinguished a general trend in rose windows by looking at the specific setting of the structure in the façade-as-a-whole (fig. 276). The earliest examples of a rose window proper are found in the facade of St. Denis (c. 1144) and the west roses of the Cathedral of Mantes (c. 1200) and the north window of the Notre Dame of Paris (c. 1220). These windows were characterized by geometrical twelve-divisions (3 x 4) and were placed under a circular arch (fig. 276; 1). The circular window could also be positioned under a pointed arch (fig. 276; 2), as was done in the Cathedral of Reims (1230). A further development was seen in the transepts of Notre Dame in Paris (1257), where the rose windows of the transepts were inscribed in a square with pierced spandrels (fig. 276; 3). Fig. 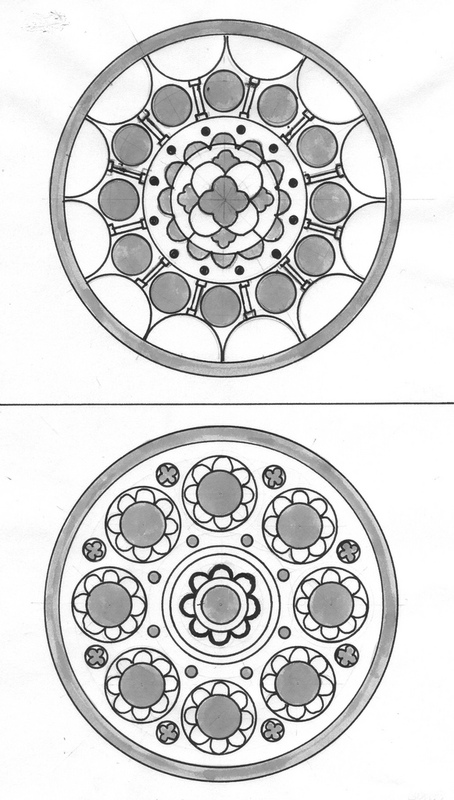 276 – The development of the rose window in four stages, based on their setting in the façade as given by KRIEHN (1913/1996). 1. In a circle; 2. Under a pointed arch; 3. Within a square; 4. In the tier of lower windows. The last step in the architectural position of the rose window was the placement in the tier of lower windows (fig. 276; 4). So it became a part of a complete window composition, as can be seen in the south transept window of the Saint-Ouen in Rouen, dating from the fifteenth century (fig. 277). Fig. 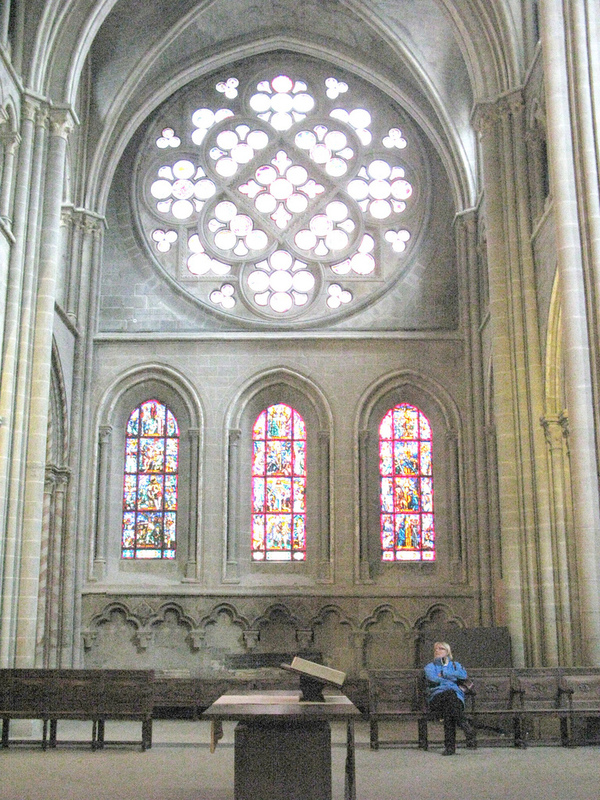 277 – The rose window in the southern transept of the Saint-Quen in Rouen is an example of the late stage in the development of this particular type of windows. The construction started around 1318 and was finished some two hundred years later in 1536. A classification of the rose windows could be tried by counting the number of spokes and additional signs. This number might have a reference to a specific form of division thinking. It can be assumed that a three-fold thinker prefers a three-fold division, while a tetradic thinker would favor a four-fold division (of the circle). Higher divisions, as visualized in twelve, sixteen, twenty-four or even thirty-two spokes, are outside the range of the division thinking sensu stricto. However, their numbers are sometimes multiplications of the three-, four- or six-fold. The eighteen division in the outer rim of the Saint Quen in Rouen (fig. 277) is a three times six multiplication of the six-fold inner motive. The York cathedral (England, 1230 – 1240) started off with a rosette of six ending with twenty-four pillars and arches at the outside. The twenty-four division in the western rose window of the Notre Dame of Paris (France, 1240; see fig. 276-1) has, on the other hand, a twenty-four division in the center, without reference to lower divisions (24 – 12 – 24). Its counterpart in the northern transept of the same church, dating from 1250, is steeped in a multitude (12 – 24), with the Blessed Virgin Mary and Christ Child in Majesty as a central motive. The window in the southern transept (fig. 276-3) has a quatrefoil in the center. The traveling artist and architect Villard de Honnecourt, living around 1235, did not regard these numbers as very important. He drew the rose windows of the Chartres and Lausanne cathedrals (folio 29 – 30) without much intention to represent them realistically (fig. 278). A further review of his drawings – on thirty-three sheets of parchment – does show an interest in division-in-general with a particular sympathy for the pentagon (five-fold)). Marie-Thérèse ZENNER (2002) noticed a possible relationship between Villard’s drawings and Euclidean geometry. Fig. 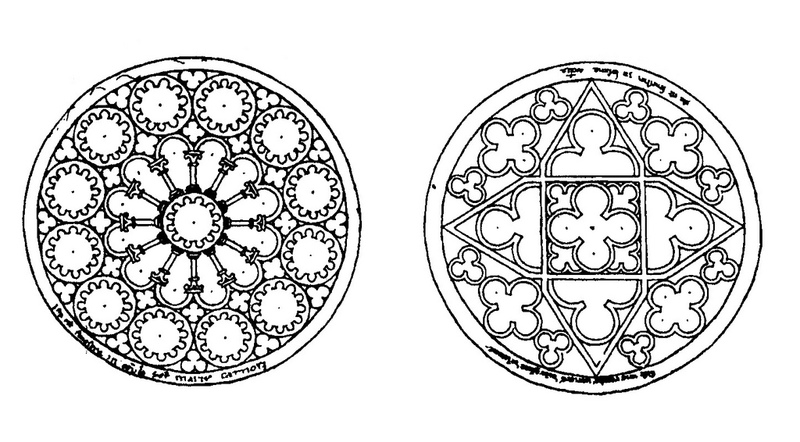 278 – Two sketches of rose windows by Villard de Honnecourt, an architect traveling through Europe between 1230 and 1240, indicate no particular interest in a detailed representation of the actual windows in Chartres (?, left) and Lausanne (right). 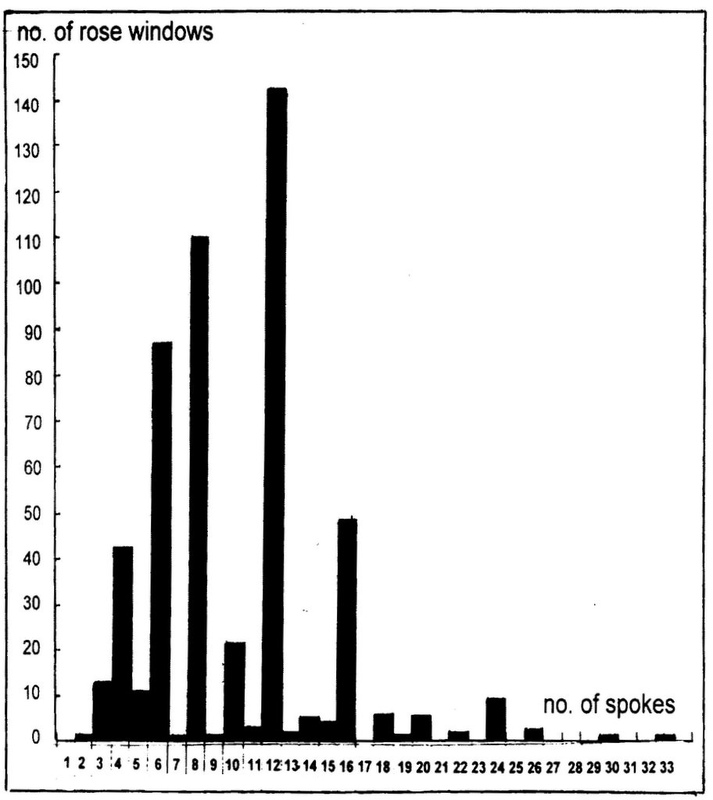 Painton COWEN (2005; p. 273) made a preliminary survey of the number of spokes in 522 medieval rose windows. He gave the figures as an exercise in numerology and did not make any reference towards division-thinking. The outcome is graphically depicted in fig. 279. Fig. 279 – The number of spokes of 522 medieval rose windows. Data given by Painton COWEN in ‘The Rose Window’’ (2005), diagram by Marten Kuilman. The number 12 is the most common, not only of its (biblical) symbolic value, but also for its ease to divide a circle. The wide variety of divisions of the rose windows is remarkable. The number twelve (27%) seems to be the most common, followed by eight (21%), six (16%), sixteen (9 %) and four (8%). The list also includes odd numbers like seven, nine, eleven and thirteen, which cannot be designed with the compass and straightedge. The seven-fold division is present at the church of Caussade (Tarn-et-Garonne, France) in an unusual pointed rose. It was probably influenced by the fourteenth-century rose window at Beaulieu Abbey in Ginals. This former Cistercian monastery was founded in 1144. The Eglise Saint Pierre et Saint Paul in Précy-sur-Oise (France) has an eleven-fold tracery, which is exceptional. The number of thirteen spokes is represented in the south rose window of the St Jacques church in Dieppe and on the north façade of Cremona Duomo. The latter cathedral has twenty-six spokes in the west and eighteen spokes in the south window. A systematic research project on the rose windows was carried out by scholars of the McGill University in Montreal (Canada). They traced the genesis of these features with computer-aided modeling (CHARBONNEAU et al. 2006). The history from modest-sized oculi to the great tracery networks was followed from a designer point of view. The difficulties of rose window typology are discussed. Two types of jointing schemes are distinguished: the flat plate and the wheel-type. The joints in the flat plate type radiate from multiple peripheral centers, while the wheel-type have a single central point. The former type is applied in the Notre-Dame-en Vaux in Chalon, while the latter can be seen in the south transept window of the Saint-Etienne in Beauvais. The number of foils (3, (4), 5, 6 or 8), their type (regular, semicircular, segmental or horseshoe) and orientation are considered. A relation between the size and the number of foils is suggested. Small tracery windows never have more than eight foils. Large windows have as many as ten or twelve. The quatrefoil takes an intermediate position and was used widely. No computer-aided models for the more elaborate types of windows windows of the later periods (Flaboyant) are yet available. The classification of CHARBONNEAU et al. – as they pointed out – was based on the logic of shape and do not reflect a historical development of Gothic tracery designs. Fig. 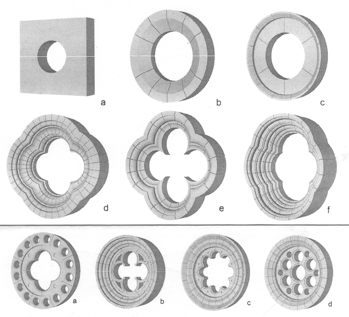 280 – These three-dimensional models of rose windows are given by CHARBONNEAU et al. (2006). The upper section shows a roundel (a), chambered oculi with and without a trim (b and c) and quatrefoil-shaped roses with different trims and jointing schemes (d – f). The lower section gives models of quatrefoils (a), openwork quatrefoil (b), eight-lobed oculus (c) and plate tracery (d). The quatrefoil was often part of a greater display of the eight-, twelve, sixteen-, twenty-four- or thirty-two divisions. It can be spotted in the middle of the rose window (façades) in Amiens and Carcassonne (1280), in the heart of the transept windows of the Notre Dame in Paris (fig. 281), in the southern transepts of the Amiens and Chartres cathedrals and many other places. Fig. 281 – The southern rose window of the cathedral Notre Dame of Paris shows a twelve-fold division of the main circular field in which the threefold (double outer rim) and four-fold (inner rim and center) are also present. The three- and six-fold division of circles can be noted in the four corners. The window was constructed around 1240 and is much more complicated than the earlier rose window in the west façade. The best result of this overview is the suggestion of a development in time towards an increase of higher subdivisions (12 – 16 – 32) in the rose windows constructed after 1240. The increase in number, surpassing the number of division thinking proper, is an indication that quantity became important. 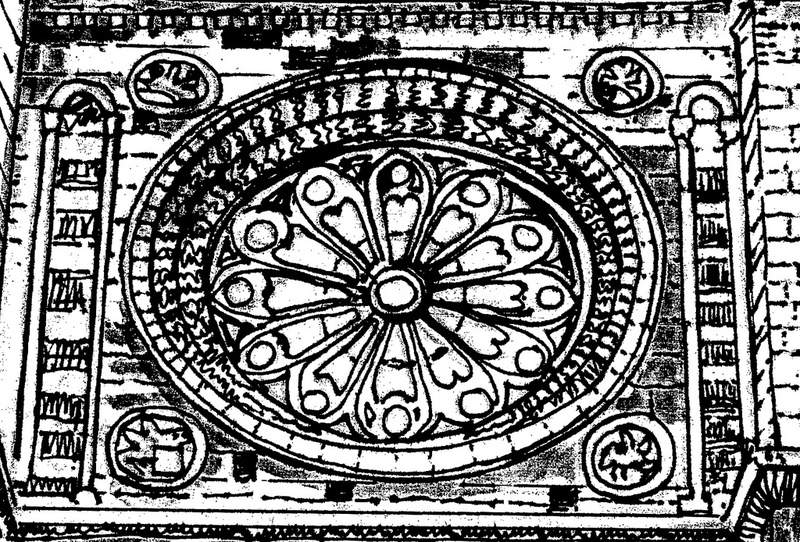 The widespread introduction of rose windows at the beginning of the thirteenth century – and its rapid development from relative simple eight or twelve-spoke wheels into elaborate windows, like Amiens and Saint Quen in Rouen – is an architectural event, which reflects a general move from simplicity into a complexity. The complex ideas of the Second Quadrant of the European cultural history (600 – 1200) were expressed in the unity of the oculus. The simplicity of the oppositional in the Third Quadrant (1200 – 1800) came alive in the increasing complexity of the rose windows. This mental turn-around is known as a chiasmus, a word derived from the Greek letter chi (X). The oppositional element becomes a dynamic entity in its own right, growing bigger all the time. The term is used in a poetic communication (poetry) as a ‘rhetorical device’. The Lausanne cathedral (Switzerland) warrant special attention from the point of view of quadralectic architecture, because it brings together a remarkable display of number symbolism ordered in a tetradic way. Fig. 282 – A schematic division of the rose window in the southern transept of the cathedral of Lausanne can be interpreted from a quadralectic point of view. Squares and circles are the main graphic building stones. A correlation with the various quadrants is suggested in the text. Fig. 283 – The rose window of the southern transept of the Lausanne Cathedral is an example of ‘quadralectic’ architecture in its finest form. All types of tetradic features are organized in such a way that they represent an ‘Imago mundi’, which has a great resemblance to the modern interpretation of the quadrants. The explanation is given by Painton COWEN (2005). The rose window of Lausanne is in many aspects the apotheosis of tetradic symbolism as it came about in the ‘Imago mundi’ (world view) of the noble cathedral builders in the second half of the thirteenth century (BACH et al., 1955). Squares and circles are the basic constituencies of the round window in the southern transept in the Lausanne cathedral (fig. 282/283). They represent ‘un système de composition variable a l’infini’ (a system of composition, which could be varied indefinitely; BEER, 1975). The square stood for the material of the earth (the four corners of the earth), while the circle was the iconographical representation of the universe (cosmos). The description of their various windows and its possible meaning in a quadralectic context is given here, following the previous authors and Painton COWEN (2005; p. 208). The latter used a different way to number the windows, due to the exclusion of the small leave-like type of windows. Ellen Beer (in BIAUDET, 1975) did not use any numbering. She gave the interpretive names within the circles. The leave-like windows were also left out. The following sequence coincides with the numbers given in fig. 282. 1. The center of the inner square is filled by round windows depicting the basic experience of movement. Annus (the year) is flanked by two oppositional entities: Sol and Luna and Dies and Nox. The central window (no. 1) was replaced in the nineteenth century, just like the whole of the square section. Annus is now depicted as God the Father, seen as the Prime Mover and the Final cause. The central section is related to the Aristotelian concept of the four causes: final – formal – material and efficient. These basic elements provide the dynamics for any communication. The adjoining windows (No. 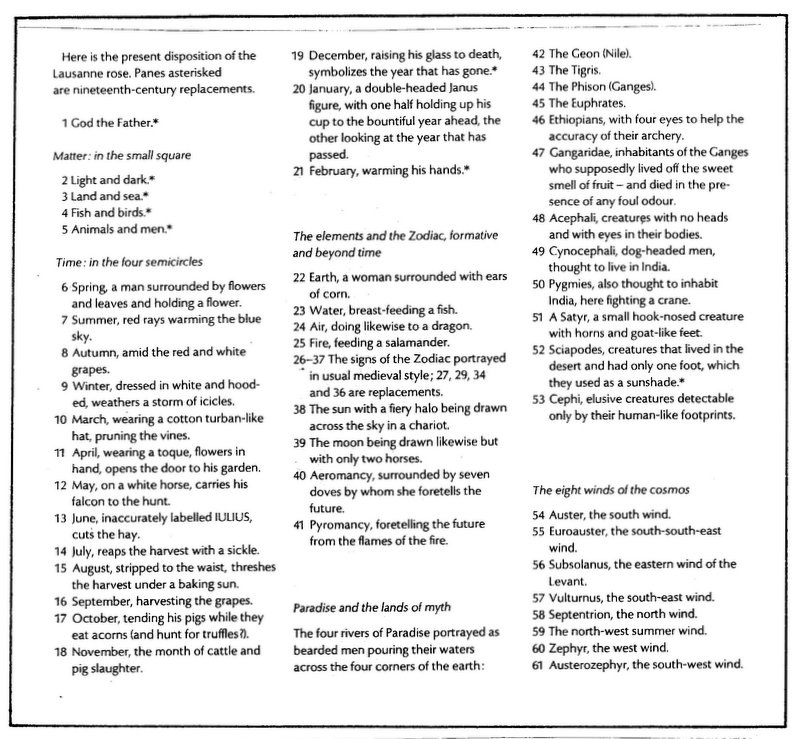 2 – 5 by Bach et al (1944) and the same numbers by Cowen (1979/1992/2005) are representations of four sets of oppositional entities: light and dark, land and sea, fish and birds and animals and men. These four sets give a creation story in a nutshell: from the first light to men, in four stages. The initial two-division (of the individual sets) is immediately part of a wider communication with men as its guiding agent. The four-division is there, right from the beginning. 2. The next four half-circles contain four sets of three months and the four seasons (Ver – Estas – Autumpnus – Hyems). This combination of periods in time (months and seasons) points to a division. Time is a much more abstract item than the material (square) creation of the world. The human mind can divide a cosmic presence (circle) directly into a higher four-division. Again the setting and counting of Cowen’s description differ considerably from the numbering by Bach (1955) and Beer (1975). However, the main interpretation of months and seasons is the same. 3. The four half circles of the seasons, which are situated around the cen-tral tilted square are themselves embedded in a straight square of which the corners are filled with three sub windows. The four Rivers of Paradise (Geon (Nile) – Tigris – Phison (Ganges) – Euphrates) are set in a full circle, while four sets of paired monstrous races are depicted in half-circles. The interpretation of the rivers and the odd human beings by Cowen and Beer are in agreement. The four triplets refer to Paradise and a mythical world with scary and deformed monsters. The (square) setting leads the observer to the idea of a worldy, material subject. The ‘Rivers of Paradise’ are the only ‘Christian’ association in the whole work of art, if the later change from the Annus-figure to God the Father in the window No. 1 is not counted. The rose window of Lausanne is, besides its tetradic dedication, a strong pagan statement. The representatives of monstrous races figured in folklore. They were hardly appreciated by the Roman Catholic Church, other than a warning for the dangers outside their own, religious world. The Aethiopes, Gangrida, Oculus, Cynymologi, Pingmei, Satyri, Sciapodes and Ceffi (or Cephi) were a collection of strange beings in faraway lands. Their presence was known for ages and used to evoke an element of fear in the (cvhristian) belilevers. The Arnstein Bible (Germany) was created in 1172, some thirty years before the Lausanne rose window. It gave a drawing (folio 243) of seventeen monsters, including giants, pygmies, blemmyae and donestres. Most knowledge was derived from Augustine of Hippo’s famous book ‘The City of Gods’ (Book 16, Ch. 8). He relied, in turn, on classical Greek and Roman sources (FRIEDMAN, 1981). 4. 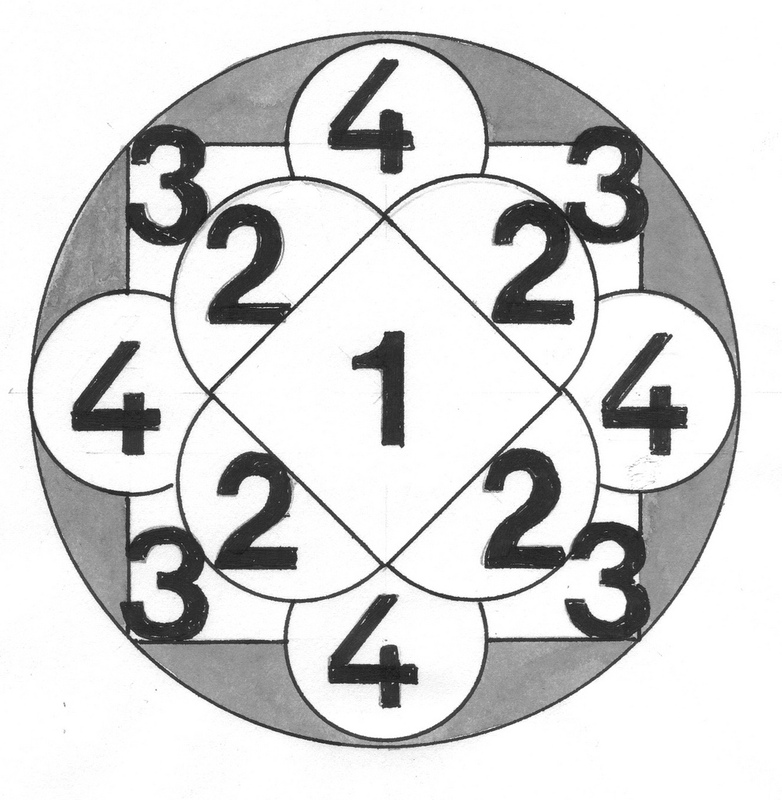 Four circles break through the ‘earthly’ square again.They contain the four elements (Ignis – Terra – Aqua – Aer) and the twelve signs of the Zodiac (4 x 3) plus four forms of prediction (Pyromanci – Geomanci – Hydromancia and Aerimancia). It seems that these four circles are ‘elementary’ indeed, with Ignis (fire) to the north, Terra (earth) to the east, Aqua (water) to the south and Aer to the west. The difference in interpretation by the more recent (Cowen) and older (Beer) authors is again noteworthy. The sequence (top-clockwise) by Ellen Beer is: Ignis – Terra – Aqua – Aer, while the same sequence is described by Cowen as: Fire – Air – Water – Earth. The ‘quadralectic’ sequence (in relation to the ‘meaning’ of the quadrants) would be: Fire – Air – Earth and Water. The eight winds of the cosmos form triplets at the outer rim. The different names (Beer and Cowen are in agreement here) lead to an ‘upside down’ picture with North (Septentrio) pointing to the bottom of the page and the South (Auster) to the top. The Lausanne rose window is the apotheosis of the four-fold, and as such a marker point in the European cultural history. The window was made from 1220 – 1235. The planning probably started in 1205. The consecration by Pope Gregory X took place some seventy years later, in 1275. The tetradic way of thinking, which had been present in the collective memory of Europe, reached a glorious visibility. The Forma quadrata mundi – as brought forward by Jerome in his commentary of St. Mark – was presented in the Vivian Bible (First Bible of Charles the Bald). The gold-covered Bible dated from the middle of the ninth century (Paris, Bibl. Nat Ms lat. 1, fol. 329v). 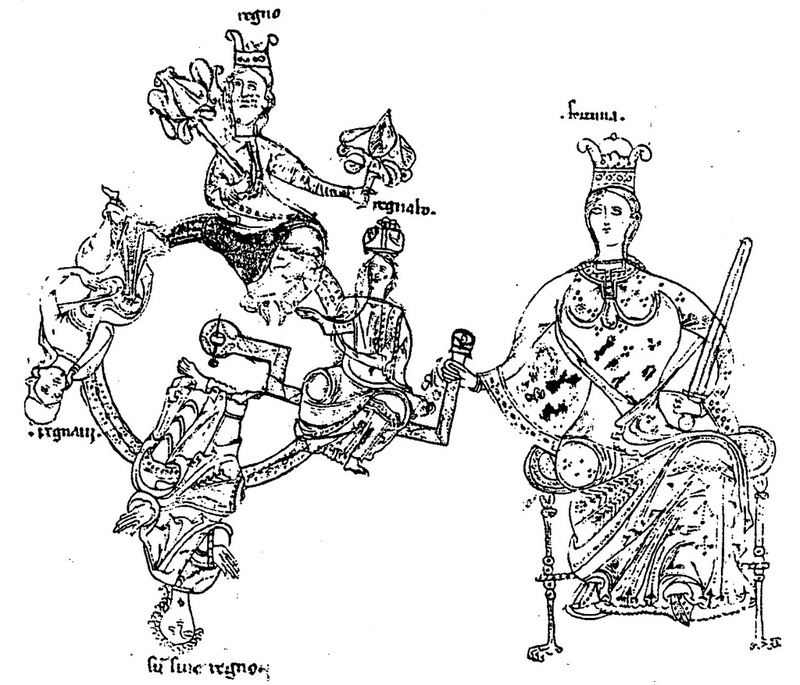 The concept of the Mundus tetragonus was elaborated somewhat later in the Codex Aureus of St Emmeran, made for the same ruler (Charles II) in 870. Apparently, the concept was still firmly imprinted in the mind of the people living in the twelfth and thirteenth century. Circular structures were part of a collective consciousness. The wheels of fortune (rota fortunae), rose windows and labyrinths in manuscripts and churches kept the candle burning. Its deepest perception – and possibly also its purest expression – was found in the European cultural history between the years 750 and 1200 AD, the formative years of Europe-as-a-culture. The four-fold lost its innocence thereafter, only to return around 1800 to open up the stagnant and restricted world of oppositional thinking.